Ironically one of the best places to congregate around our home has always been out of it, or at least partially outside of it. From the patio to the porch to the garden, all these places represent our preference for some outdoor time now and then. It is natural, therefore, that these preferences extend to our comfort choices and the appliances and gadgets we employ in getting these comforts. One of these creature comforts we employ is the fireplace. While the fireplace may more aptly belong in the den or in the kitchen, in our love of the outdoors, we have placed the fireplace outside the kitchen and den setting and placed it in our backyards and patios to serve as a source of warmth and heat for those times when we are spending some quality time outdoors. As a matter of fact, after adding an outdoor fireplace, the kitchen is usually the next traditionally indoor space that is brought outside. This would make perfect sense. Why trouble yourself cooking indoors while the family enjoys themselves at the outdoor fireplace when you can cook at the outdoor fireplace itself? A fireplace outside kitchen extension can integrate many different kitchen appliances into the outside space. The number of appliances that can be added really depend on the space you have and what you like to do when you are entertaining. A fireplace is always a good idea because it adds ambiance and warmth for those late night get togethers. 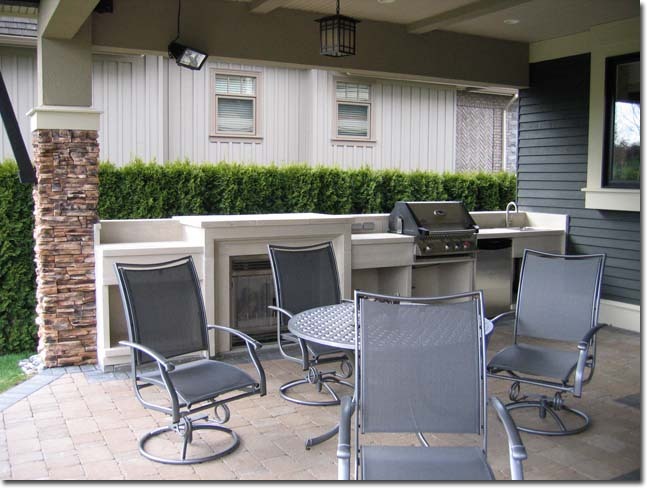 One of the first things you should consider when you are thinking about extending your outdoor fireplace is the materials you are going to use for your setup. Understandably, things are going to get a bit hot with your outside kitchen. And you need to consider the weather, but a lot of appliances, fireplaces, infrared outdoor heater and tiki torches are designed for life outside. Some materials can withstand the ravages of the elements and the heat generated by your outside kitchen better than others. The most common building material to use with an outside kitchen is stone, brick and other clay materials. These materials are traditionally the best to use with buildings that are expected to be exposed to a lot of heat and weathering. For your appliances, the common indoor household appliance will not be able to withstand being placed on your outside kitchen. Most appliances used for fireplace outside kitchens will usually be made of tougher materials. The most common and most popular is stainless steel. This material can withstand a lot of abuse and remains clean and shiny even after many years. There are a few safety and other considerations when you are planning on extending your fireplace with an outside kitchen. The most glaring safety hazard would be the possibility of fire. Try to avoid having any highly flammable materials near your outside kitchen. This includes dried leaves, twigs, overhanging tree branches and gas lines or gas tanks. Also, check with your local ordinances for local air pollution policies that might concern the smoke you generate from your outside kitchen.